As baptized Christians we are called to proclaim God’s message of salvation, to bring Christ to each person so they can receive Him in faith. We are not called “simply to teach a doctrine, but to proclaim Jesus Christ by our words and actions, to make ourselves instruments of God’s presence and actions in the world” (CDF Doctrinal Note on Some Aspects of Evangelization, Dec. 3, 2007). Pope Benedict reiterated this when he wrote on the New Evangelization, reminding us that evangelizing is a form of living, not merely speaking. (Pope Benedict XVI “The New Evangelization” Dec. 12, 2000). 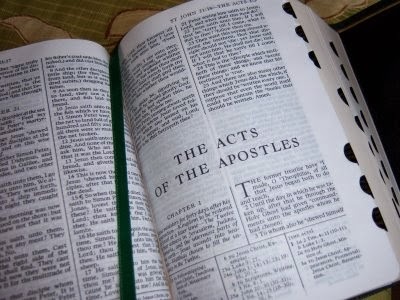 It is hoped through our reading of the Acts of the Apostles we will glean practical insights that can be applied to our lives. May we, like the early Christians, “live Christ”, and be bearers of God’s message of salvation to the many souls He places in our lives. 1. Pray with and from these texts, asking the Holy Spirit to point out what God wants you to learn through this study. 2. Ask, what do these passages teach or reveal about being a witness to Christ? 3. Does your life reflect these teachings? 4. Note any resolutions or changes you are making as a result of what you have learned. September 11: Introduction to the Acts of the Apostles, found in our retreat packet and Chapters 1 and 2 from the Book of Acts.